An all star lineup for benefit concert. It's going to be a unique musical experience on Sunday night, December 13. That's when over thirty noted Boston-area musicians take the stage of the Regent Theatre in Arlington, MA at the Rock 'n Soul Holiday Concert to benefit the Music Museum Of New England and to celebrate the season. Performers at the event will include several long-time stalwarts of the local music scene, as well as some of the best newer talent. They will share two hours of seasonal good cheer with their fellow musicians and fans, including audience sing-alongs of holiday music. Showgoers are asked to bring a new toy to donate to Toys for Tots, and a member of the United States Marines will be on hand to collect them. Barrence Whitfield, known for his incendiary live shows, will serve as Musical Director of the concert. He'll be accompanied by the Rock 'n Soul Holiday All-Stars led by Jim Haggerty and featuring Charles Hansen, Andy Plaisted, Allan Scheinfeld, Mario Perrett and Paul Ahlstrand. WMFO DJ Easy Ed will keep things jumping between performances, and a surprise guest or two may make an appearance as well. Built in 1916 and recently restored, The Regent Theatre is an intimate 500 seat venue. Reserved seat tickets for the Rock 'n Soul Holiday Concert are $18 and center orchestra seats are $28 (including a $3 facility fee). They can be ordered online at www.regenttheatre.com or by calling 617-646-4849 (a $3 service fee will be added to online and phone orders). Tickets will also be available at the box office (with no service fee) in advance or on the day of the show. The Regent is located at 7 Medford Street in Arlington, just off Massachusetts Avenue, and free parking is available across the street. MM/ONE, the Music Museum Of New England, is a nonprofit organization whose mission is "to preserve, honor and showcase New England's musical heritage." It currently exists online at www.mmone.org, but aspires to build an archive of New England musical artifacts and memorabilia, and a public facility to display them in. When pioneering FM station WBCN recently went off the air after rocking the Boston area for over 41 years, its record library of over 10,000 LPs was donated to the Museum. Also in the works is The Boston Music TrailTM, sites of significance to the history of music in the region which will be identified with markers. The Trail is being launched with funding from auto magnate Ernie Boch Jr.'s Music Drives Us foundation. The markers will be placed on those sites in conjunction with the Bostonian Society, Boston's historical society, which has been placing markers around the city for over a century. MM/ONE and the Society have already worked together to place a marker on the building which housed the legendary rock and blues club The Boston Tea Party, on the occasion of the 40th anniversary of its opening. The band which played that night included Willie Alexander, who will perform at the holiday benefit at the Regent. MM/ONE was founded in 2006 by four men with long-time ties to media, music and finance in the region. Steve Nelson managed the Tea Party in 1967-68, and produced rock shows at The Woodrose Ballroom in South Deerfield in 1969 and the Paramount Theater+ in Springfield in 1970. Today he is a video and solar energy entrepreneur residing in the Berkshires. His photos and writings have appeared on this website (see, for example, his review of an exhibit in New York about The Velvet Underground. Harry Sandler played with the Boston rock group Orpheus, best known for their classic hit single "Can't Find The Time". They opened for Janis Joplin in 1969 at Tanglewood (yes, Janis played Tanglewood!). He is currently an executive with a leading speakers' booking agency in Boston. Michael Fondo is a former Fidelity executive now with a private equity firm in Boston. And Gary Sohmers, who is producing the holiday concert with Leland Stein of the Regent, is familiar to many Berkshire TV viewers as the pop collectibles appraiser in the Hawaiian shirts on the PBS series "Antiques Roadshow." 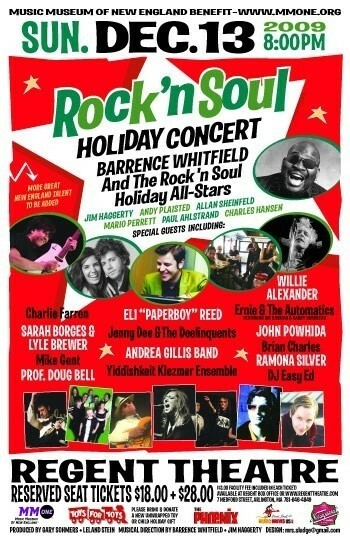 The Rock 'n Soul Holiday Concert is a show not to miss, benefiting an organization well worth supporting. See you at the Regent on the 13th!